The winning paper for the seventh annual was written by engineering major Forrest Csulac, 20. For his writing, Csulac was awarded the David Arthur Memorial Scholarship, which is an award of $500. The colloquium is held once a year and a scholarship is given in the honor of a late BC faculty member David Arthur, who died due to cancer in 2008. Csulac’s paper discusses the argument between two brothers questioning if there is a divine harmony in the universe. This argument is in the story “Rebellion,” found in Fyodor Dostoevsky’s book, “The Brothers Karamazov.” Csulac broke it down into smaller pieces, presented the misconceptions, acknowledged the counter arguments, and then discussed whether or not the brothers’ arguments stood. Csulac is on track to graduate at the end of this semester and will be attending UC Berkeley in the fall. He plans to use his engineering degree to work in the researching, development, and implementation of various alternative energy technologies. Every spring, a philosophy essay contest is held in order to pick the colloquium participants. The student has to be currently enrolled at BC and the topic has to be regarding a philosophical issue. The essays are read and ranked, then the top three are picked for the colloquium. Csulac, Jeffrey Kenney and Andrew Martin were the three participants who read and discussed their philosophy papers for the colloquium. After the papers were read, the students were required to do a question and answer session with the audience and most of the Bakersfield College philosophy professors. In this case, the papers were original papers that were not submitted for class, but they are also allowed to submit papers that were used for a class assignment, and students are encouraged to do so. “I’ll encourage a lot of students. ‘Hey, you should rework this, you should maybe add more sources, you should make it longer.’ It can be an original work or it can be a paper submitted for class,” said philosophy professor Anna Poetker. The winner is typically chosen by the strength of the paper, but how well the speaker does during the question and answer session is also taken into consideration, said Poetker. The colloquium was held on April 29 in the Levan Center for the Humanities, and was open to anyone interested. The Arthur David Memorial Scholarship was not the only scholarship awarded. 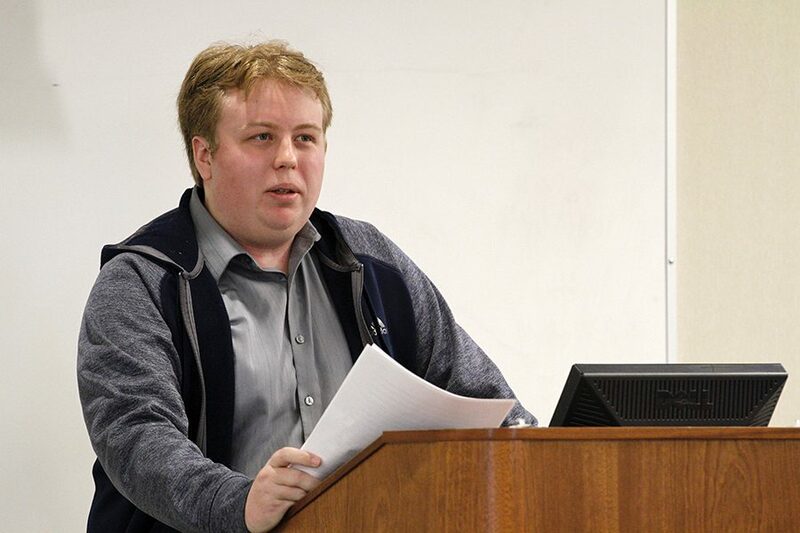 Poetker also announced that Jeffrey Kenney has been awarded the philosophy departmental award scholarship.